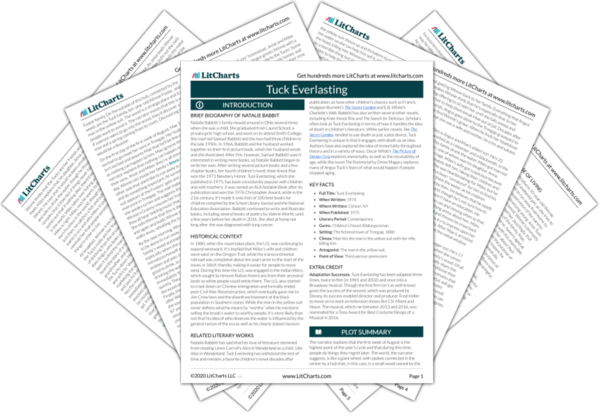 Instant downloads of all 945 LitChart PDFs (including Tuck Everlasting). Welcome to the LitCharts study guide on Natalie Babbit's Tuck Everlasting. Created by the original team behind SparkNotes, LitCharts are the world's best literature guides. A concise biography of Natalie Babbit plus historical and literary context for Tuck Everlasting. A quick-reference summary: Tuck Everlasting on a single page. In-depth summary and analysis of every character of Tuck Everlasting. Visual theme-tracking, too. Explanations, analysis, and visualizations of Tuck Everlasting's themes. Tuck Everlasting's important quotes, sortable by theme, character, or character. Description, analysis, and timelines for Tuck Everlasting's characters. Explanations of Tuck Everlasting's symbols, and tracking of where they appear. An interactive data visualization of Tuck Everlasting's plot and themes. Natalie Babbitt's family moved around in Ohio several times when she was a child. She graduated from Laurel School, a private girls' high school, and went on to attend Smith College. She married Samuel Babbitt and the two had three children in the late 1950s. In 1966, Babbitt and her husband worked together on their first picture book, which her husband wrote and she illustrated. After this, however, Samuel Babbitt wasn't interested in writing more books, so Natalie Babbitt began to write her own. After writing several picture books and a few chapter books, her fourth children's novel, Knee-Knock Rise, won the 1971 Newbery Honor. Tuck Everlasting, which she published in 1975, has been consistently popular with children and with teachers; it was named an ALA Notable Book after its publication and won the 1976 Christopher Award, while in the 21st century, it's made it onto lists of 100 best books for children compiled by the School Library Journal and the National Education Association. Babbitt continued to write and illustrate books, including several books of poetry by Valerie Worth, until a few years before her death in 2016. She died at home not long after she was diagnosed with lung cancer. 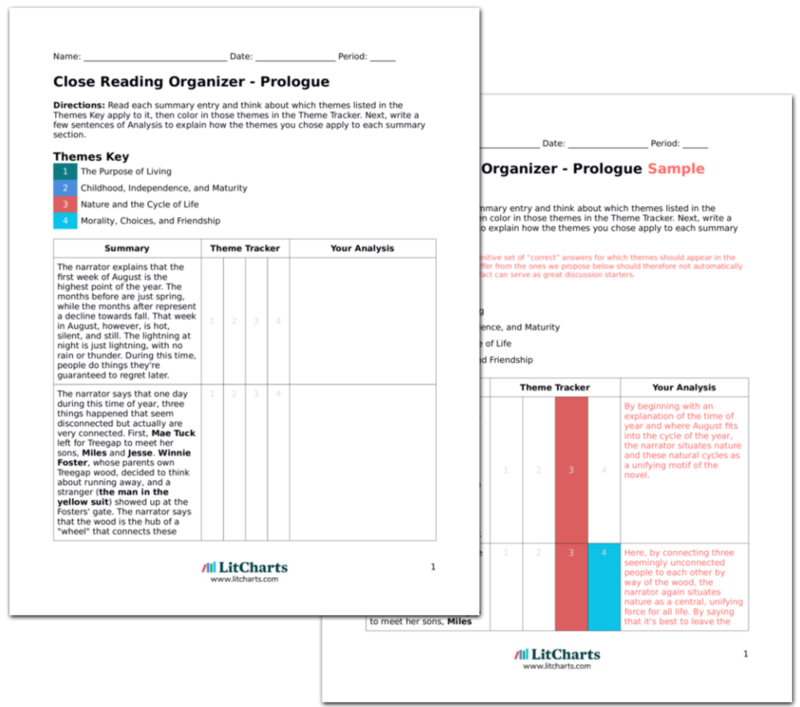 Get the entire Tuck Everlasting LitChart as a printable PDF. In 1880, when the novel takes place, the U.S. was continuing to expand westward. It's implied that Miles's wife and children went west on the Oregon Trail, while the transcontinental railroad was completed about ten years prior to the start of the novel, in 1869, thereby making it easier for people to move west. During this time the U.S. was engaged in the Indian Wars, which sought to remove Native Americans from their ancestral lands so white people could settle there. The U.S. also started to crack down on Chinese immigration and formally ended post-Civil War Reconstruction, which eventually gave rise to Jim Crow laws and the disenfranchisement of the black population in Southern states. While the man in the yellow suit never defines what he means by "worthy" when he mentions selling the brook's water to worthy people, it's more likely than not that his idea of who deserves the water is influenced by the general racism of the era as well as his clearly stated classism. Natalie Babbitt has said that her love of literature stemmed from reading Lewis Carroll's Alice in Wonderland as a child. Like Alice in Wonderland, Tuck Everlasting has withstood the test of time and remains a favorite children's novel decades after publication, as have other children’s classics such as Francis Hodgson Burnett's The Secret Garden and E.B. White's Charlotte's Web. Babbitt has also written several other novels, including Knee-Knock Rise and The Search for Delicious. Scholars often look at Tuck Everlasting in terms of how it handles the idea of death in children's literature. While earlier novels, like The Secret Garden, tended to use death as just a plot device, Tuck Everlasting is unique in that it engages with death as an idea. Authors have also explored the idea of immortality throughout history and in a variety of ways. Oscar Wilde's The Picture of Dorian Gray explores immortality as well as the inevitability of age, while the novel The Postmortal by Drew Magary explores many of Angus Tuck's fears of what would happen if people stopped aging. Adaptation Successes. Tuck Everlasting has been adapted three times, twice to film (in 1981 and 2002) and once into a Broadway musical. Though the first firm isn't as well-known given the success of the second, which was produced by Disney, its success enabled director and producer Fred Keller to move on to work on television shows like CSI: Miami and House. The musical, which ran between 2013 and 2016, was nominated for a Tony Award for Best Costume Design of a Musical in 2016. Brock, Zoë. "Tuck Everlasting." LitCharts. LitCharts LLC, 10 Apr 2019. Web. 23 Apr 2019. Brock, Zoë. "Tuck Everlasting." LitCharts LLC, April 10, 2019. Retrieved April 23, 2019. https://www.litcharts.com/lit/tuck-everlasting.